When I wake up to a rock-solid frozen world as happened today, I know my winged garden visitors will appreciate it if I fill frozen bird baths for them. Sure, they’ll peck at frost covered leaves and rooftops, but there isn’t much in the way of liquid water to slake their thirst. And this week, as cold air from the North Pole continues to seep southward into much of the US, there’s little likelihood they’ll find much liquid in the neighborhood. Even ponds at sea level are beginning to freeze up around here — not a common occurrence. 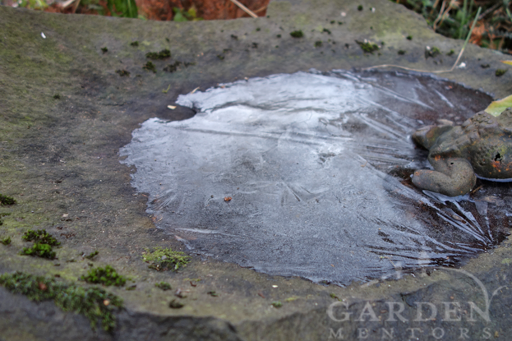 After two nights of frigid temperatures, our basalt dish stone’s bird water was a shrinking ice cube. So, in addition to providing seed and other bits of food to supplement their diets, I add fresh water to our basalt dish stone bird bath. Weeks ago, I stored ceramic and glass dishes that are otherwise out for the birds. These have a tendency to crack or just plain shatter during a freeze — especially if they’re filled with water. But the frozen rock isn’t as likely to break in cold weather — even if it has contact with water. Sure, over time rocks do break, but this one has held together for who knows how many hundreds of years, so I’m trusting it’ll continue to do so. 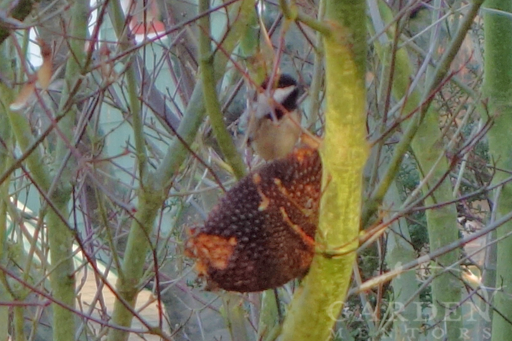 Chickadee enjoying a the seeds of a sunflower I harvested & preserved from last summer. In winter, having access to fresh food & water is important for these darling songbirds. Still, I take care when I melt the ice that froze over night. To provide the birds with some liquid refreshment, I pour cold tap water over the ice. I focus the slow stream into the center of the ice, which is thickest. By using cold rather than hot water, I reduce the risk of a rapid, crack-inducing temperature change. Plus, when it’s 20F outside, cold tap water is relatively warm. So, adding it will defrost a bit of the giant ice cube resting in the bird bath. 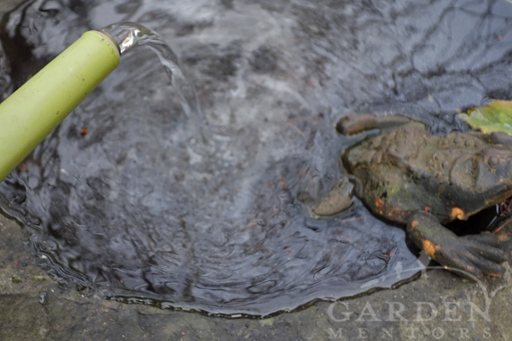 Slowly, I pour a few cups of cold tap water into the center of the frozen birdbath water, defrosting the ice a bit and providing liquid refreshment for wildlife. Tomorrow, after another below-freezing day and way-below-freezing night, everything will refreeze, so I’ll be adding in a little bit more water again. Today, the birds will drink and maybe even take a quick, chilly dip to refresh themselves during this very dry, very cold time of year.